Ha Long Bay, in the Gulf of Tonkin, includes some 1,600 islands and islets, forming a spectacular seascape of limestone pillars. Abundant scenic beauty, archeological and geological significance, cultural and historical connections, fresh seafood and proximity to international gateways make Halong Bay one of Vietnam’s most popular places to visit. Unlike most of cruise in Halong bay, the Imperial Classic Cruise was built in the style of traditional junk. 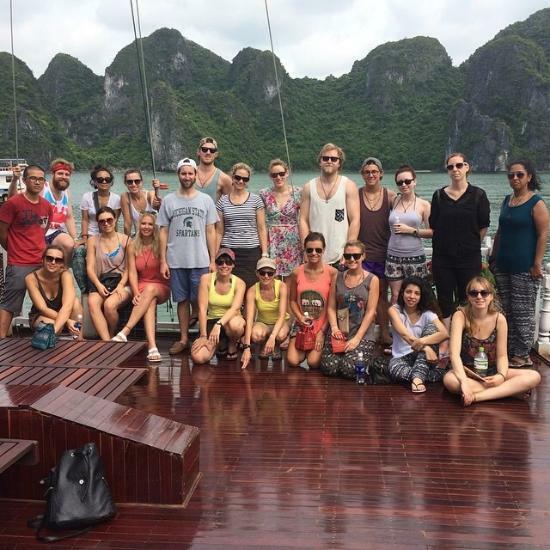 With 8 cabin, we cater smaller group with an aim to please travelers who want to travel in small group or private tour. Our 12 staff crew are very professional, enthusiastic and friendly will make your stay unforgettable. That is the home away from home. There are some important things which are really necessary on your tour and not to be forgetting on Ha Long Bay tour. The tourist should bring sneakers, sunglasses, sun lotion, hats which can cover the entire head at the time of cruise visit as these few things are good to maintain the health of travelers at the time of this amazing tour. There are some important instructions for the special visitors and they should read the tour guide arrangement before starts their tour for landscape and all the views. The Ha Long Imperial legend cruise is made in the style and pattern of Chinese. The staff and members of the crew are professional and know the value of your time as they are experienced. They are always be there for make your each and every holiday moment cherish and unforgettable. The day first is starts with the Ha Long Bay in which there are so many things for providing you a wonderful morning with the kayaking, hiking, swimming as well as scenic cruise etc. So, here we have the entire schedule to maintain the time in the Hang Long city. The tourist comes into the habor of Ha Long in which, the facilities available at all the time from 7:45 to 8:45. The time of 12:30 is very important as it is the time of appreciation and welcome with the imperial cruise as well as important people of the cruise for all the facilities. The time of 13:00 is really amazing just like the heaven as the visit in Iceland and beautiful. This is the time of very special lunch on the cruise which is really unforgettable. The one of the best thing is that, there are so many amazing things like visit of amazing place by cruise etc. The legend Halong Bay is really professional as well enough to maintain your time with all the aspects. The time of 14:30 is a time of taking some rest in the Halong Bay and captures some memories as well as pictures in your mobile and cameras after taking the lunch. The 15:30 is the time to go on the highest island named Titop Island which has the highest and the small tender is the only thing through which, you can go there. The amazing and beautiful view can be seen through that precious Island. The time of 16:30 is the perfect timing for swimming as well as kayaking to make you refreshed at one more time. The 19:00 is the perfect time to enjoy the delicious dinner cooked by the best chefs at all the time. The time of 20:30 is perfectly private time for you in which, you can do anything whatever you want such as brush, bathing, talking or fishingetc. The amazing and peaceful sound of the Sea is truly heart touching and along with the karaoke of cruise and squide of ships are enough to make your mood like never before. The day two consisted Surprising caves which is something like a mystery, cooking classes to make you rich with the talent of Hanoi food and scenic cruise. Your amazing second is starts from the 6:00 with the mountains and sea which is really amazing view to get refreshed by eyes. The 07:00 time is for breakfast cooked by our professional chefs and their team. 08:00 is the time to visit the one of the most incredible and Surprising cave of Hanoi Long Bay. The Journey of second day is starts with this beautiful and incredible cave. The time of 09:00 is the time to come back from there and go for another visit in the Hanoi Long Bay. 10:00 is the most special time as it’s the time to learn the cooking of Vietnam by the professional cooking classes for tourists. This is really amazing because the tourists can’t forget the famous dish of Vietnam named “NEM “ and they can learn this dish in these special cooking classes. The time of 11:00 is the lunch time which has is happened on the cruise to give you feeling of tour maximum, before it turns back to the Harbor. 12:30 is the time to take the bus which is provided by us to the Hanoi. The day ends before evening as all the tourists are to be sending to their hotels before 16:30 for take them rest and enjoy in the hotel. It is starts from the Hanoi Long Bay (L, D) and includes the kayaking, swimming, hiking as well as cruise. The time of 12:30 is the final time to be on pier and seriously it is the wonderful time as the entire professional member and staff of crew is there to welcome you in an amazing manner which will surely give you feeling of proud. 13:00 is the time to feel those moments which are not be find anywhere in the entire world except this amazing place because the lunch on the cruise with the surrounding of sea, water sailing, sparking lime stones and exotic views are enough to make this place most beautiful in the world and make your trip unforgettable for your entire life. 14:30 is the time of relaxation and capturing some snaps and photos to make your each and every moment memorable for life time. This is the free time on cruise after lunch and while going to the most beautiful place of Hanoi Long Bay. 15:30 Small tender brings you to visit Titopisland, hiking to the top of the island from where tourists can capture panoramic view of Halong Bay. 16:30 is the time for swimming as well as kayaking to make you refreshed. 19:00 is the time of dinner which is prepared by our professional and experienced chefs especially for you. 20:30 is the perfect time to get back your bed or make your mood relax after the entire day tour. You are free to sing, karaoke, listening music on the cruise and make your whole night amazing with the best surrounding of the world at that time. 08:15 is the time to transfer the boat for the other destinations of Ha Long Bay which is less touristic. 09:30 is the time to find the most amazing cave which is known as the name of Fairy lake caves. These caves are full mystery as well as historic views. No any single person can stop themselves to take the photos here. 10:30 is the time for kayaking and its searching in the tranquil bay. 12:00 is the time of take some rest before a delicious lunch on boat as the lunch time on this day is 13:00 which is prepared by our professional chefs. 14:00 is the time to stay at that place which is local fish farms at which the regional peoples stays and cultivate pearls as well as raise fishes. 15:00 is the time to come back on cruise. 16:00 is the most relaxation time on the boat as it’s the time to go on your sleeping part of the boat which is full of private. 19:00 is the dinner time as it’s the second time at which you are taking your special dinner on the boat prepared by our professional chefs. 20:30 is the time to take relaxes and joins in few activities on boat according to your wish. 7:00 is the time of breakfast with the healthy and testy food, coffee as well as tea. 8:00 is the time to get a tour on Surprising caves as it’s the most amazing and beautiful place in the entire Ha Long Bay. 09:00 is the time to come back to Ha Long Bay. This is the way in which, there are hundreds of Islands comes with all kinds of heights, shapes and views. This is really adventurous and amazing to see at all the time and enough to cherish your heart. 10:00 is the time to get the cooking classes on the cruise which is the all new experience for you but it is unforgettable. 11:00 is the time to get the farewell lunch as it’s your last night on the boats so it has been severed before comes at the harbor. 12:30 is the time to occupy your seat in bus to Hanoi. 16:30 is the perfect time to go back to the hotel and take rest after this long trip of today. It included the Kayaking, swimming, scenic cruise and hiking. 12:30 is the time to come on the boat with the warm and unforgettable moments of welcoming you. This is really amazing to feel those moments of welcoming at boat. 13:00 is the time to get the amazing and delicious lunch with the surrounding of sparking lime stones in your cabin, sea view and imperial Cruise is truly designed for the luxury feelings. This is truly that feeling which can be say the feeling of heaven in this world. 14:30 is the time at which your cruise comes at those moments and views which are the most beautiful parts of the Ha Long Bay. This is your private time to spend with you only on boat and feel these all moments. 15:30 is the time to reach at the top of the Ha Long Bay city through the highest Ti Top Island of the time in that city. This is truly incredible to take the pictures from this height as the entire city can be seen by this hiking. 16:30 is the time of swimming as well as kayaking to get refreshed again. 19:00 is the time for healthy and delicious dinner prepared by our professional and experienced chefs. 20:30 is the ending time of this day as this is the time to feel all those moments which you have spent on this tour and take a rest with your pictures and taking snaps to make your tour unforgettable on the boats with the surrounding of the exotic and beautiful views, sailing music of water and sparking lime stones of the sea. 08:30 is the time to have a wonderful visit to Surprising Cave. 09:30 is the time to reach at our personal sailing boat which is really beautiful to provide you true feeling of sailing in the water for long lasting two hours. 11:20 is the perfect timing to come into your very luxurious bungalow. 12:00 is the time to enjoy inside the bungalow with the sunbathing, relaxing and take some swimming etc. There are so many options in the bungalow to make your mood awesome by playing badminton, volleyball, pool and tennis etc. So, all these things are just like a new world in its one bungalow. The one if the main thing is that, you can take enjoy of the bike riding from this bungalow to a short tour of near village named Viet Hai village after giving some extra chargesU.S. $5/ person. 07:00 is the time of breakfast. 08:00 is the time get the boat named Royal Palace Cruise. This is the expert’s opinion that, don’t go far from the direction of Ha Long Bay as it is the most beautiful place and you will get so many new and beautiful things to see there at the time of cruising. 10:00 is the time to get the cooking classes on the boats to teach the especial food of Vietnam such as “nem”. 11:00 is the time to provide you farewell or ending lunch before go back to the harbor. 12:30 is time to go back to the bus for Hanoi. 16:30 is the time at which, bus will send you to your hotel. The Catba Sandy beach resort is the place of natural peace, relaxation and free from sounds and extra activities. This is to inform that, this is the very simple place at which many times, internet connection, Wi-Fi and power cut happened. So, it shourl be in your mind that, the better place to accommodations can be find at Catba mainland easily which are less with all the technical facilities at all the time. The Bungalow and Catba tour performs on the regional guides. So, there is more than one guide to help you out. Halong Bay is really North Vietnam's highlight, it's a very beautiful place to visit and I really enjoy my trip here with the amazing scenery. The guide is so kind and help me to take a lot of photos, finally I want to say thanks to Ashley for helping me arrange a really good trip! I like the food in boat, it was fabulous. Swimming and kayaking was great here, I really enjoyed it with my girlfriend. I can spend my whole day on sundeck to deep in the panorama view of this Bay. Plus: the sunrise on the bay (advised by the guide, very nice and attentive). Minus: I would have preferred to bathe in a more distant place and a little less polluted. Everything is provided: towels, shoes, toothbrush. It is necessary to envisage at least 1 night and 2 days to enjoy well. Must do: the sunrise on the bay (advised by the guide, very nice and attentive). The least: I would have preferred to bathe in a more distant place and a little less polluted.